Later this year, when the natural gas supply for Trois-Rivières, Quebec, is temporarily shut off for pipeline maintenance, Cryopeak LNG Solutions will step in with its “virtual pipeline” to keep the gas flowing to homes. The small Richmond-based company’s system uses liquefied natural gas (LNG) tanker trucks, storage tanks and automated regasification equipment to provide natural gas where pipeline gas isn’t available. Cryopeak employs 15 people and operates a fleet of four LNG trucks and six trailers. It also has storage and regasification equipment it developed that turns LNG back into gas, which can be used for heating, fuelling LNG trucks or producing power in generators that would otherwise burn diesel. Founded in 2012 by Calum McClure – a former Teekay Corp. (NYSE:TK) executive – Cryopeak has capitalized on an emerging domestic market for LNG, while the big players like Shell and Petronas have been trying with less success to develop multibillion-dollar projects for the Asian export market. While at Teekay, where he was vice-president of innovation and technology, McClure identified a niche for LNG – transportation and power generation for remote, off-grid mines and communities. Cryopeak sources its LNG from FortisBC’s Tilbury Island plant – which is undergoing a $400 million expansion – and hauls it by tanker truck to remote areas, where it is stored and regasified using Cryopeak’s equipment. One of the company’s customers is JDS Silver, a B.C. mining company that uses LNG instead of diesel to supply power to its Silvertip mine near the Yukon border. BC Hydro is also a Cryopeak customer. 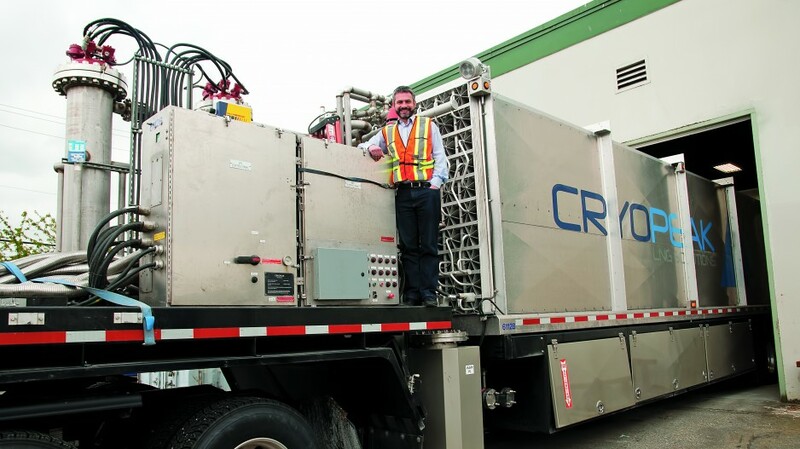 Cryopeak supplies the LNG for a demonstration project in Anahim Lake, which until recently got its power from diesel generators and now gets it from LNG-fired generators. The company has developed three separate business units. On the service side, it provides LNG sourcing, delivery, storage and regasification. The company also has a division that trains operators of LNG-powered vessels, trucks and related equipment. Seaspan Ferries Corp. and BC Ferries are among the customers for its training services. Cryopeak is developing a third business unit that will sell its storage and regasification systems in ready-to-use, easily implemented form. FortisBC’s Tilbury Island facility and Mount Hayes plant near Ladysmith are the only plants producing LNG in B.C., but other domestic suppliers will soon be coming online. AltaGas Ltd. (TSX:ALA) plans to soon start producing 30,000 gallons of LNG per day at its new LNG plant in Dawson Creek. Ferus Natural Gas Fuels Inc., meanwhile, is planning a $200 million LNG plant near Fort Nelson to supply two new mines in the Yukon and Northwest Territories. More recently, KT Energy, a Canadian subsidiary of China’s Kai Tian Energy Group, announced plans for a mini-LNG plant neat Fort Nelson. The marine industry is already switching from bunker fuel to LNG, as is the trucking industry. And once the rail industry makes that move, McClure said, it will provide a significant boost for companies like his.